Work. 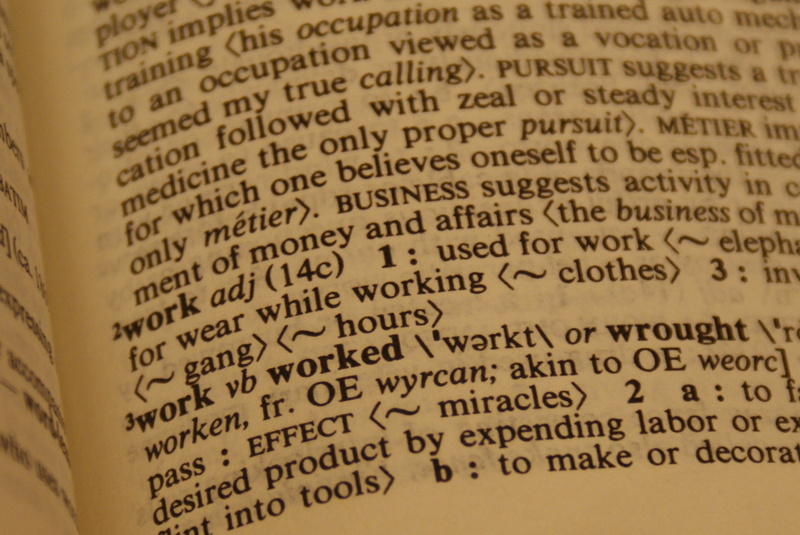 Why are we talking about “Work” as a “mark” of our church? Work is something we do during the week; work is stressful; work is what pushes us back to this place to find refuge, respite, restoration. Why are we talking about work? To put “Work” in our newsletter, on our website, to embrace it as one of our ‘marks’ is risky. It doesn’t sound nearly as inviting as Welcome or Wonder (more on that next week), and it doesn’t sound nearly so church-y as the obvious “Worship.” But you know, it might be one of the most fitting words we could have chosen to help describe what church is all about. Perhaps you know the good, Southern phrase, “That sounds like work.” Another pastor notes, when someone uses this phrase it often indicates that what sounds exciting or worthwhile or fun to one person doesn’t exactly motivate the other person to leave whatever they are doing. You know, it may sound cliché, but the reality is that anything worth doing is work. Which brings me to Ben Affleck – yes the actor-slash-director. I know some of you have less than wonderful things to say about Ben Affleck’s acting career. But that’s not what I want to talk about. I want to talk about what he said in his acceptance speech at this year’s Oscars. I was watching the Oscars. I don’t generally pay much attention to the minutiae of the speeches, but I was struck by the honesty and tenderness in his words. You expect actors to gush – their speeches to reflect the butterflies and rainbows of the same make and model of the romantic comedies in which they star. You don’t expect them to acknowledge the reality of what it takes to maintain and sustain relationships. What I also didn’t expect – but maybe should have – was the flurry of negative attention and speculation Affleck received. Some keyed in on his naming of their marriage as work as an indicator that their marriage was clearly doomed. However, anyone who has ever been in any kind of relationship (so, all of us) knows they take work. Sure, he was talking about his marriage, and there is surely no more significant relationship, and no more significant work, than with the one person we find, fall for, and to whom we choose to commit our lives and ourselves – if we are so lucky. And, really, any relationship takes work. Anytime we commit to being friends with, community with, anytime we decide to wrap our lives up in the lives of other people, we are risking ourselves, and we have to commit to working – working to develop intimacy, vulnerability, trust. It is work and it is risk. I bring all this up because I believe there is no more fitting way to talk about the kind of work it takes to be church. It can be tempting to believe that all we need to do is walk in, sit down, and our work is completed. And maybe for some of us just showing up is work. We took the risk of personal commitment and showed up to church, have joined our lives with a particular faith community, and now we want to rest. We just want to fade in the background. And in so many ways, in our culture that grows increasingly suspicious of institutions, that offers us so many other ways to stay busy, even to build community – showing up is a type of work. And for many of us, doing the vulnerable thing of coming clean with our choice to follow Jesus, to come to church, is a significant form of work. I don’t begrudge the effort that takes for some of us. We ought to appreciate this work as well. But, here’s the rub: it cannot end there. Sure, it takes work to show up. It takes more work to remain church together. It takes work to learn and grow and stay together. It takes work to ask tough questions – wrestle with life’s hard realities, knowing we may ask questions that might not fully find answers. So, here we are, talking about work, and chances are you’re already weary and tired. Maybe just listening ‘sounds like work.’ To already overworked, busied people, the question persists – why do we need to keep working? Whatever happened to Jesus’ eternal rest, easy yoke, light burden? When do we just get to be comfortable? We humans are not prone to seeking out hard work. In most things, we seek out easy fixes don’t we? We jump on board fad diets instead of working toward lifestyle changes. We look for the miracle workout – in only 10 minutes you will have the same physical results you can get in hours of tough exertion. In our relationships, too: we are often quick to rule people out, to cut them out entirely, when they frustrate us, or hurt us, rather than doing the work to be honest, be vulnerable, be in relationship. Nowhere is this more pronounced than in our social networking where, with a click of a button we can both “add friends” and “unfriend” the same people. But none of this is lasting. None of this is life-giving or soul-sustaining. That piece takes work. And see – church is work – all the things about being church – our welcome and our worship, which we’ve already been thinking and talking about, that takes work. Maintaining and caring for our space – that takes work. Even one of the words we use in our worship – liturgy – literally means work – the work of the people. When we talk about liturgy, we are talking about the holy work of gathering together and worshiping God. It sounds like work and it is work. It is God’s work. Jesus continues to call us to his work – we are in the midst of writing our own resurrection stories – Jesus is coming back to call us, again and again, reminding us that there is work to be done. At the end of John’s Gospel, Jesus has already returned and appeared three times – to Mary, to the disciples (once without Thomas and again with him present). For all it sounds, the twentieth chapter of John seems an adequate ending to the story. And yet there is one last chapter, one last story of encounter. But not just any encounter; the Gospel story today is equal parts call story, commissioning story, and resurrection story. Imagine the disciples – following a whirlwind week of a triumphal entry into Jerusalem, having their feet washed and their meal served by their Lord, watching him tried, beaten and executed – then heard rumors of his return, and then touched the wounds in his hands and side – they must have been weary. They must have been a little emotionally taxed, overwhelmed by life. So – after all that, a group of them return to the water. There they are, sitting on the shore of the Sea of Tiberias, Peter – always a little impulsive, quick to action – announces, “I am going fishing.” The rest of the disciples, I imagine, shrugging their shoulders, join along. I mean, what else are they going to do, right? Maybe the disciples were going back to business as usual. After all, by trade, many of them had been fishers prior to following Jesus’ call. Maybe they were hiding out – trying to blend in. Maybe they just needed to take their mind off of everything that had happened – too much to process – so they were just trying to stay busy. I get that, don’t you? When life throws me curveballs, when I am consumed with worry or anxiety, I seek out busyness – things that feel ordinary and routine to keep my mind busy on anything but what I probably ought to think about. Whatever reason drove the disciples into the boat to fish that night, matters less than what follows. They caught nothing – which likely wouldn’t have been a very helpful distraction – and were prepped to call it a night. (Literally: day was breaking, it was time to draw up the nets and find some breakfast.) And then Jesus appears. Jesus shows up to remind them of who they are and what they were originally called to be. And he challenges them. He instructs them to “Cast the net to the right side of the boat,” and they will “find some” fish. Yeah, I’ll say. They “found” so many fish they couldn’t even lift the net over the boat. It is John who recognizes Jesus first – telling Peter, “It is the Lord.” And it is, of course, Peter who acts first, throws on his clothes, and jumps into the sea running ashore. He leaves the rest of the disciples to figure out how to get the fish in the boat, and the boat back to the shore. Then we have one of the most iconic exchanges in all of the Gospels. If you will remember a few pages prior, Peter is asked three times in a row: “Don’t you know that man, Jesus?” To which he replies, emphatically, No. And as we know, upon the rooster’s morning call, Jesus’ foretelling was made complete. At the conclusion of John’s Gospel, we have another dialogue wherein Peter is asked three times in a row the same question. This time, though, the questioner is Jesus. Can you imagine what must have been going on in Peter’s head? A few days prior, as Jesus himself predicted, Peter rejected his friend, his teacher, his God. Then Jesus was gone – rejected and gone. Now he is back, and it would be enough for Peter to try to wrap his brain around that one. And now Jesus is standing on the shore of the lake, feeding them breakfast, and treating Peter the same as always, as though none of the horror had happened. It is the same call on all our lives. Ultimately, he is calling us to follow him into a new reality. Jesus provides, and invites disciples to contribute what they have – and by extension contribute who they are. He returns once again to call them to work. And being Christ’s Church is work. Following Jesus as a community takes work. It is appropriate that we are talking about what it means to name ‘work’ as a mark of our church in the shadow of his Resurrection. Our desire to remain unchanged – to seek comfort first – is a desire for a form of death, not a desire for resurrection. The power of the resurrection is that it calls us out of slumber, out of tombs, out of death. Which sounds really nice, doesn’t it? Are we really prepared to follow Jesus not only unto death, but into his Resurrection? In so many ways we have followed Jesus to his death, building for ourselves tombs – places we can hide, places we can fade into the very terrain and not be found. We do this to remain safe. Yet, that is not our biblical reality. We know the reality of Christ’s resurrection, and it ought to change everything. It must change everything, else it changes nothing. Bone-deep knowledge of resurrection would take away the fears that some of us presently use to justify our cautious, self-protective lives. Death-dealing fear would be replaced by life-giving faith, and we would be called to do God-knows-what for God-knows-whom. … In the process, we might lose much that we have, perhaps even our lives – and that is the threat of the resurrection. And it is. Loving other people – feeding Jesus’ sheep – that sounds like work. It is risky work. The kind of love and action that we are called to if we are going to follow Jesus – in life, death and resurrection – is a love that irritates and inconveniences. It calls us to “bear[…] non-violent witness to a crucified and risen Messiah who continues to say, … ‘follow me.’” And this is work. The reality of the call of Jesus to feed his sheep, to love as he loved, is that it is risky. It doesn’t offer security because it changes everything. Jesus call is new each day for us – to show up, to keep fishing, to feed his sheep. It sounds like work, doesn’t it? To keep showing up? To risk vulnerability to create, maintain, sustain relationships? To do the work of Christ’s service in the world – to heed the call of love-in-action? Here’s the work of church I think that we need to hear today. It is easy to learn about and talk about missions – the work of Christ around that world that touches us on an emotional level, and, in many ways, seems so much more tangible, measurable, maybe even more important. And in many ways this church doesn’t need to hear about the call of Christ to go to work in our community, our country, our world. We recognize need, and we recognize our call to put Christ’s call to love into concrete action. What about loving our neighbors who sit not even feet from us in church? This is where the marriage parallel rings even more true – we have joined our lives with this community – and yet, are we strangers who occupy the same space at the same times week after week, or are we working towards realizing God’s call to beloved community? Are we going to put the work into building relationship with one another – risk ourselves and risk vulnerability – and continue to put the work into sustaining those relationships? Will our church be a church that lives into the threat of resurrection – the threat that Christ changes everything, and calls us to be changed to the core of who we are? Will we make the choice to walk in new life – a choice that happens sometimes even moment to moment? Here’s the truth – we need each other. We need each other to do the work. And not just the big, obvious work, like addressing issues of hunger, poverty, injustice. Obviously, as individuals we cannot do that work alone – we can’t even do that work alone as a congregation – we need other churches and organizations, other groups, other gifts and resources. But besides that, we need each other to do the work of being human, of being in relationship, of being church. We need each other to help raise our children, to help care for the aging, to help care for our homes, our bodies, our earth. We need each other to help care for ourselves. Because that too, I believe, is what Jesus meant when he said to follow him and feed his sheep. And that work can only happen if we are willing to take the big and daily risk of being community with one another. We need each other. We cannot do it alone. And it is work. It is God’s work. Friends, there is no other group of people I’d rather do that work with than you. Parker Palmer, The Active Life: A Spirituality of Work, Creativity and Caring. Thomas Troeger, Feasting on the Word, Year C: Volume 2. p. 425.